What historians do know is that the community was first populated by Native Americans, and then by a rugged band of settlers who set up a small fishing and sustainable farming community where they were isolated, but lived peacefully. The population swelled with the establishment of the Kill Devil Hills Life Saving Station in 1878, and by the time the Wrights arrived, there were small but habitable lodgings and camp sites, a couple stores, and enough amenities to keep them accommodated during their long winter months of testing. The following is timeline of the events that allowed Kill Devil Hills to grow into the 6,000 year-round resident community that it is today. 1700s and 1800s - Kill Devil Hills is inhabited by a small group of local farmers and fishermen. 1809 - The first mention of Kill Devil Hills appears on area maps. 1878 - The Kill Devil Hills Life Saving Station, one of 11 lifesaving stations along the Outer Banks coastline, is established across from the current Wright Brothers monument. 1900 - The Ohio-based Wright Brothers, Orville and Wilbur, choose Kitty Hawk and Kill Devil Hills as the location to test their new flying machines, and fly their first manned glider from the tall soundside dunes. The first flight is unsuccessful. 1901-1902 - The Wrights test two more gliders in Kill Devil Hills / Kitty Hawk, with mixed but subsequently better results. 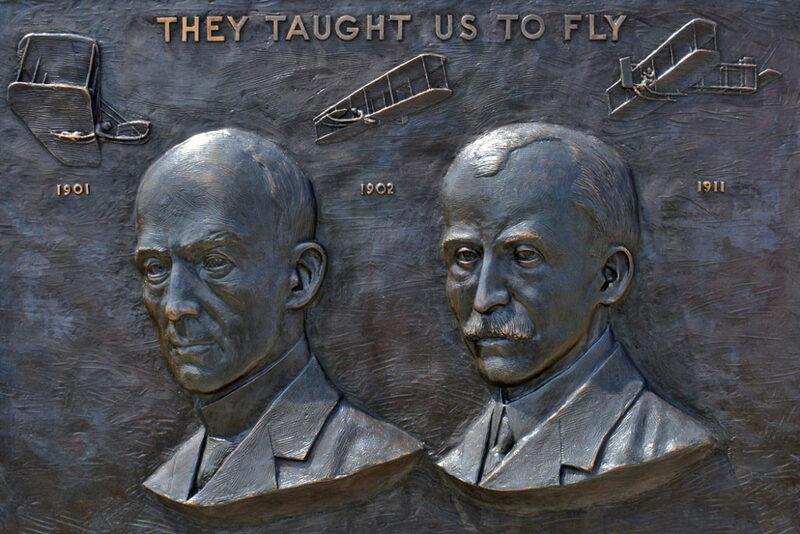 December 17th, 1903 - The Wright Brothers make the first controlled and sustained power flight. A now iconic photo of the airplane hovering above the ground is broadcasted across the world. 1911 - Orville Wright returns to Kill Devil Hills and sets a new world glider record, with a total airtime of 9 minutes and 45 seconds. The flight and the glider earn the quotable title of "The last Flying Machine at Kitty Hawk." 1930 - The design is chosen for the Wright Brothers Memorial, and an additional $150,000 is granted to the construction of the granite monument. 1932- The Wright Brothers Memorial opens to the public and is dedicated with Orville in attendance. Orville becomes the first person to see a national memorial dedicated to him while still alive. 1933 - The Kill Devil Hills Life Saving Station is closed. It is later purchased by the Twiddy family in 1986 and moved to Corolla to serve as an office. 1953 - The National Park Service celebrates the 50th anniversary of the Wright Brothers' flight by constructing two replica gliders to display at a new Visitors Center. The Memorial is soon transitioned into a National Park. 1958 - The Avalon Fishing Pier is constructed, becoming one of the first piers along the Outer Banks. 1960s - A series of motels and restaurants are built to accommodate the new "beach traffic" of fishermen and families. 2003 - Kill Devil Hills celebrates the Centennial of Flight - a week-long celebration with acclaimed visitors including Neil Armstrong, Buzz Aldrin, and President George W. Bush. The most notable site in Kill Devil Hills is the Wright Brothers Monument - an impressive granite structure complete with an accompanying Visitors Center and museum. The monument and the adjacent Visitors Center are open daily from 9:00 a.m. until 5:00 p.m. 7 days a week, except for Christmas Day. The cost to access the park is around $4.00 for adults 16 years and older.